Know someone who thinks we're all doomed? Give them some gum! This set of seven 1" (2.5 cm) tall boxes looks like a shelf of tiny philosophy books. Inside each box you'll find two fruit-flavored gumballs and a quote affirming your darkest impulses printed on the inside. 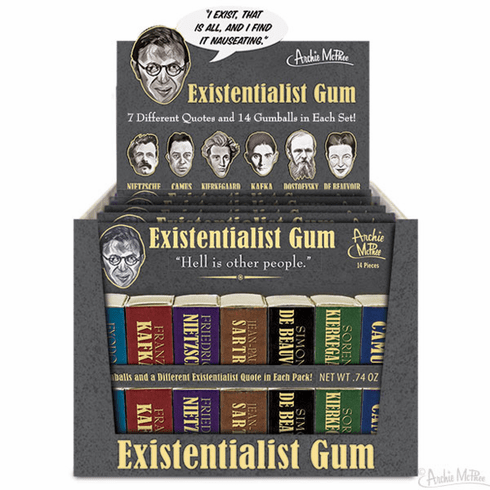 So depressing it will warm the heart of your favorite existentialist! Twelve shrink wrapped sets in each illustrated display box. Net Wt .74oz (21g).